One of my goals in life is to build my entertaining culinary repertoire. You know, so that some day I can randomly invite 10 friends over and know the 5 things I’ll make that will be incredibly fool-proof and simple, but will also make my guests happy. These are the things I think about because I’m the kind of person who majorly freaks out whenever I entertain. It’s mostly because I’m a huge stress mess, but it’s also because I like to try to attempt brand new challenging recipes when I’m super short on time and also need to clean my entire apartment and somehow make myself look semi-presentable. Yes, it’s so fun being me (but even more fun being my husband!). 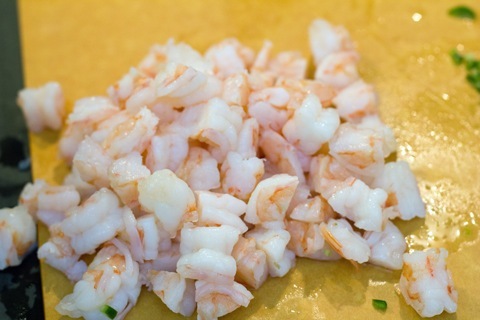 So, in an effort to find foods that are ideal for entertaining, I made this delightful Tequila Shrimp Ceviche. I actually got the idea for this dish when I had a very similar appetizer at The Oceanaire on Valentine’s Day. I quickly realized it’s one of those dishes that looks pretty impressive and tastes delicious, but is actually super simple to make. So, I went home and made my own version. And I was right. It takes no time at all. Oh, and tequila. We have to mention the tequila. Now do you want to make it? So, I brought a pot of water to a boil and cooked my shrimp for literally less than two minutes. When I drained them, I put them right in an ice bath to stop the cooking. Then I chopped them into bite-sized ceviche-like pieces. I love the color of lime juice. And my functional OXO measuring cup. 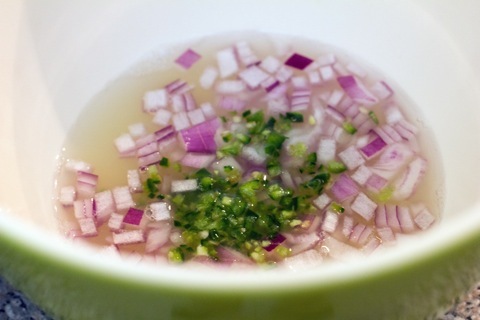 In a large bowl, I combined the tequila, lime juice, chopped red onion, and chopped serrano chili. And then I stirred my shrimp in. I popped the bowl in the fridge for an hour. 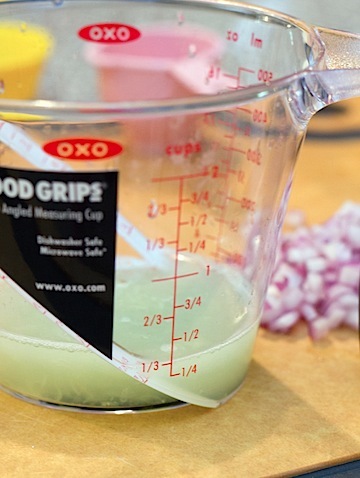 Allegedly, you shouldn’t let it marinate for much more than an hour or it will actually be too cooked. After an hour, I stirred in the cucumber, tomato, avocado, and cilantro. 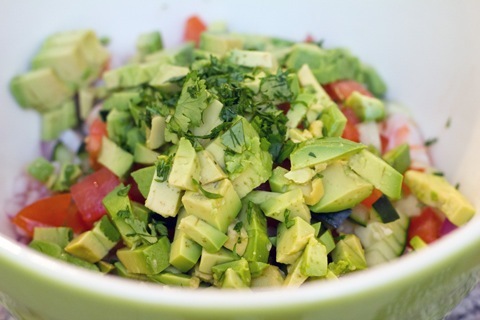 I enjoy A LOT of avocado. But by all means, use however much you want. 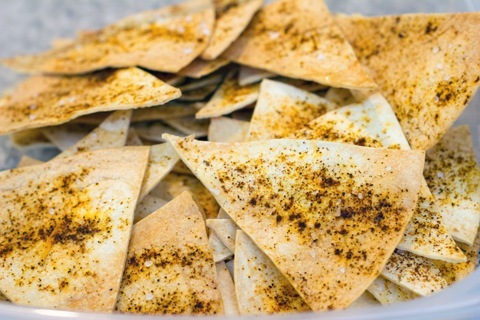 You can serve the tequila shrimp ceviche with whatever you want (or eat it with a spoon), but I highly recommend these chile dusted tortilla chips. These are also super easy. 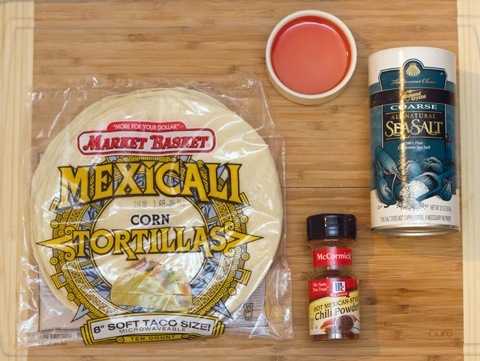 Lay a tortilla on a cutting board. Brush oil on top of it and then lay another tortilla on top of that. Continue until you have 8 tortillas layered on top of each other. 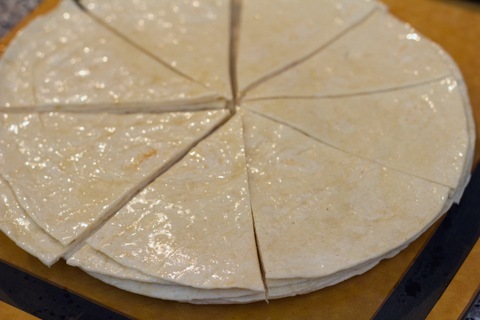 Then cut tortillas into 8 triangles. 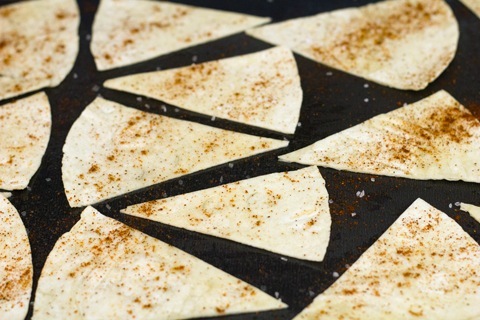 Set triangles on a lightly oiled baking sheet (with oil-side facing up). Sprinkle with sea salt and chile powder. Bake at 350 degrees for about 10-12 minutes, until nice and crispy to your liking. These chips are now all I want to eat ever. I don’t think I’ll buy chips from the store anymore as I’m pretty sure I’m just going to be making these again and again and again and snacking on them. 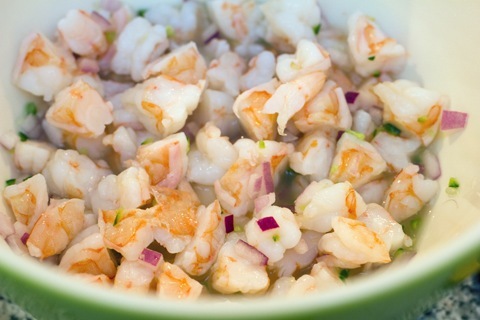 However, they’re most definitely even better when served with this ceviche. But even that was a bit of a battle because I kind of sort of wanted to eat the ceviche with a spoon. It was that good. Obviously I dipped about a million chips into it though. And then ate a million spoonfuls. This is definitely a dish for a crowd. Or a crowd of me, but you get what I’m saying. I think it’s perfect because it looks pretty impressive and tastes like a dream. But it’s so low-key and easy to make. Especially considering you can make the chips a day ahead and chop all the veggies the day ahead and keep them in the fridge. 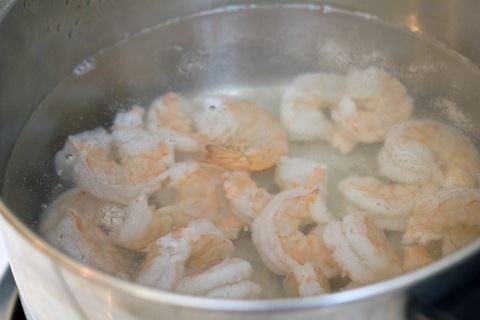 All you really have to do day of is boil the shrimp for a couple minutes and mix everything together. OK, maybe wait on the avocado, too. And since the shrimp is cooked a bit, you don’t have to worry about harming anyone at your party! Which is always an excellent thing. In case you’re worried about the tequila, it’s definitely a downplayed taste, especially with all that lime juice. I would, however, recommend eating this with a side of tequila (in a shot glass) if you do so please. It would be the most excellent accompaniment. This chip will most definitely be in my dreams. Is that weird? To say a chip will be in your dreams? Well, maybe if it was a Dorito or something it would be weird. 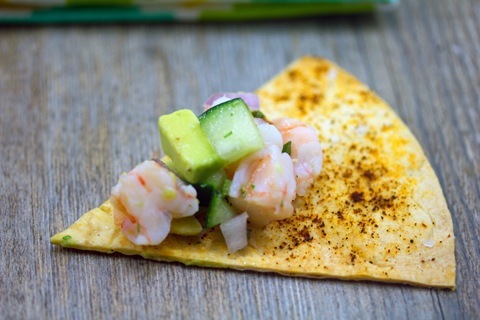 But I think a homemade tortilla chip dusted with chile powder and topped with shrimp, avocado, and more is actually OK to dream about. Because how could you not?? And now I know one thing I’ll be making the next time I have guests over. So far it’s only one, which may mean people could get a bit hungry the next time they come over. Perhaps two pounds of shrimp would do the trick? Just kidding. I’ll be exploring more make-head appetizer options in the next several months. And by the end of the year, I’ll have a plethora of recipes to make whenever guest show up. Of course, I’ll probably still be tempted to try to do one more absolutely ridiculous thing in the kitchen. One thing that will take me hours and loads of stress and won’t even come out that good. But at least they can be eating this, in the meantime! 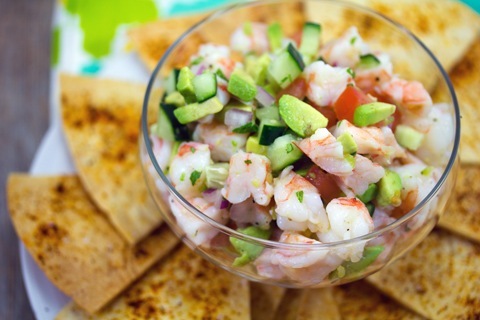 What’s your favorite appetizer to serve when you have guests? 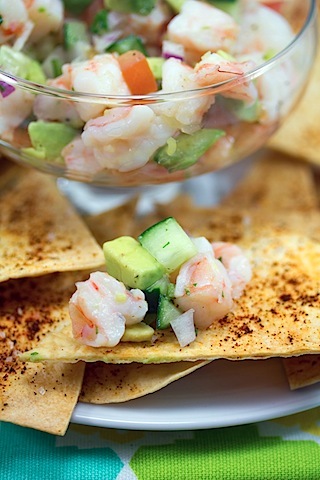 24 Responses to "Tequila Shrimp Ceviche with Chile Dusted Tortilla Chips"
I LOVE this! It really is perfect for a crowd! I’m the same way- I can feel comfortable trying 100 new recipes in my kitchen, but when we’re having guests over, I can’t seem to figure out 2 things to make! OK..seriously. 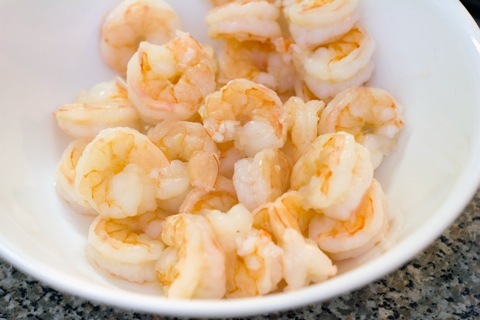 My mouth is watering for shrimp at 7:58 am! This sounds ABSOLUTELY amazing!!! I agree with Leslie, is it too early for shrimp? No? This looks phenomenal! 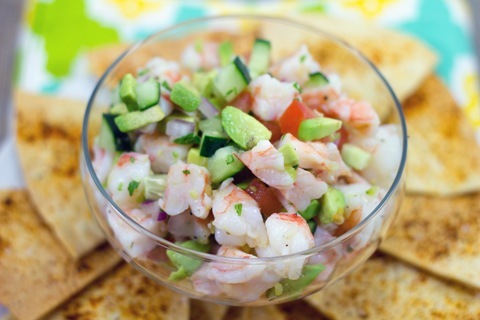 Yes to both a bunch of tried-and-trues for easy entertaining and yes to ceviche! 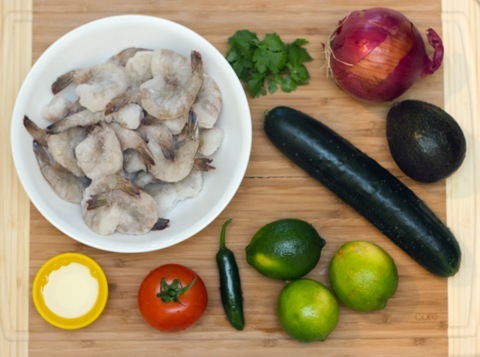 I’ve always wanted to try making ceviche, but I’m a little scared to try it raw and I see you’ve solved that problem. If I lived in a spot where I can pick up fresh seafood from a fisherman at the docks, I’d proceed. Even though I get my meat and seafood at Whole Foods, I just don’t know how fresh the seafood is. Gets me every time. Um…I think we’re the same person based on the first sentence alone. I actually have a spreadsheet of themed menu ideas with my fave foolproof dishes. I’m a nerd. 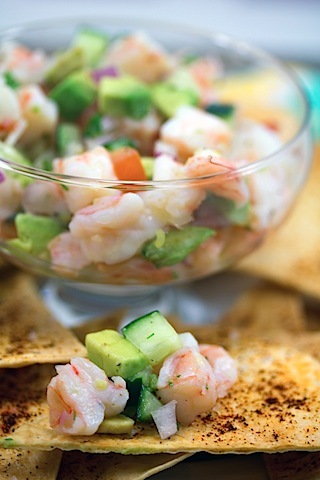 This ceviche looks sooo good! My favorite appetizers for guests fall into the “vehicle and dip” category, like baguette toasts with spiced goat cheese or ricotta-artichoke-spinach dip or goat cheese cooked in tomato sauce. Or chips and a different salsa (pineapple serrano from Bobby Flay). I think your idea of having a practiced repetoire is a great one! I, too, stress out when I’m entertaining – although I love to entertain! 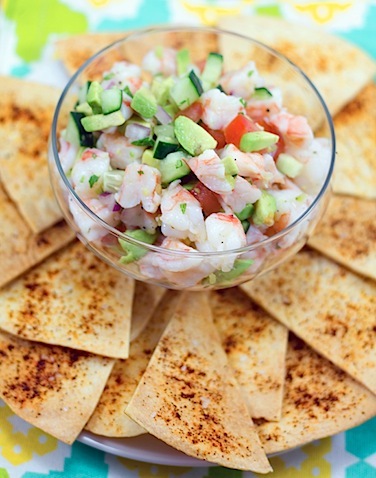 I’m always looking for easy and delicious appetizer ideas like this one. One appetizer I do make often, when I’m especially low on time, is homemade hummus – it’s really versatile, easy, and affordable to whip up! I’ll come over anytime if you’re having this ;). Josh’s mom makes something sort of similar with crab=amazing! Wow looks very tasty! I love shrimp! That last photo made me drool 😉 Leave it to you to put tequila in shrimp. I seriously love it! That looks so insanely delicious! I want them right now! I usually serve something like spaghetti and meatballs. I’d much rather have this! Puts me right to shame. 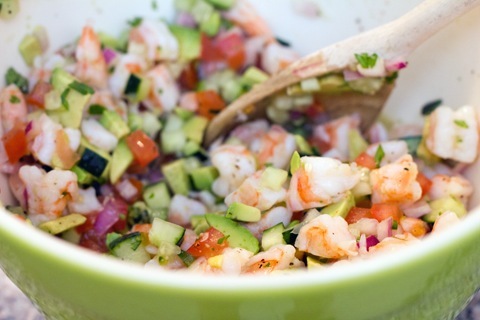 I love a good ceviche recipe. I haven’t had one since I was pregnant but I’m assuming its time to break it out and have some dip. 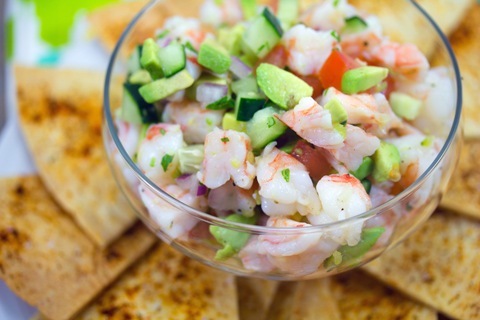 This is one of my favorite appetizers! I will be doing this complete with the homemade tortilla chips. Love the wow factor – but you know – I’d do this just for me and husband. Better be careful – you may be becoming Martha. Definitely ok to dream about. 🙂 Like you, I tend to like to try new recipes and have a million things going on when I’m entertaining, but I rely on a good cheese plate that’s out and ready when guests arrive, so I can direct them there and still be bustling in the kitchen. When I entertain, I often make one new dish, one tried-and-true and a bunch of easy sides so that, even if the new one falls through, there’s still lots of leftovers! I made this ceviche with all lime juice since we had no tequila and used garam masala to season my chips. It was fantastic!